to then recommend a portfolio. Here is what they recommend. Look familiar? Looks pretty convincing doesn’t it. They are comparing their diversified portfolio to DIA which is what I entered as my portfolio. 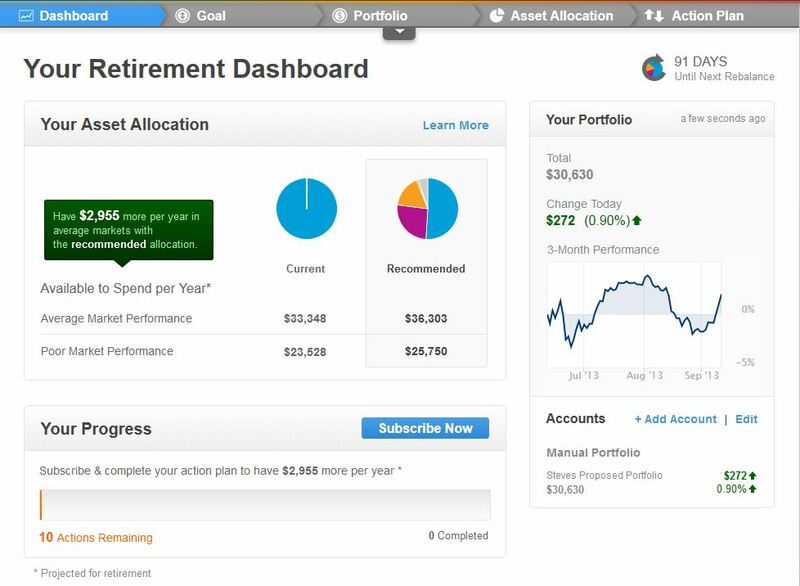 They project that I will have $2955 more to spend each year in retirement using their portfolio than if I just kept piling money into DIA. Let’s take a more careful look at what it takes to implement their recommendations. 1. 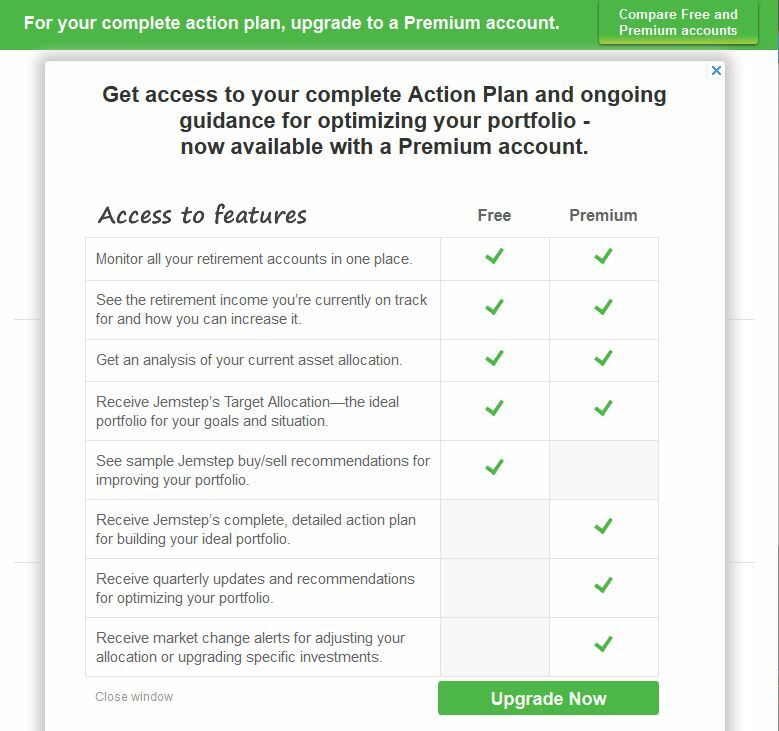 To take full advantage of their services, you have to become a premium member @ $600/yr once your portfolio exceeds $300K. Not too bad. 2. As a premium member you will have access to their premium features. “market change alerts for adjusting your allocation or upgrading specific investments”. Let’s say you are 35 when you start this plan. From age 35 until your expected age at death (77) you will receive 208 quarterly updates and recommendations. If you don’t do what you are told, when you are told, you can’t expect to derive the full improvement they project. Worse, you will receive an untold number of “market change alerts” that will require you to make decisions and worry and fret about whether or not you made the right decision. The point is, interjection of decision points and continued required steps over 52 years is not likely to produce the outcome you expected 52 years ago. If we could look ahead 52 years, I would bet there is not one person who finished his plan exactly as recommended by Jemstep. And even if he did, I would bet that the value of the portfolio is no higher than if he had simply invested in DIA for those 52 years. In investing, one size does not fit all. We believe the individual investor is best served by an investment strategy and investment guidance expressly based on his or her unique investor profile, including financial goals, current situation, and investment preferences. 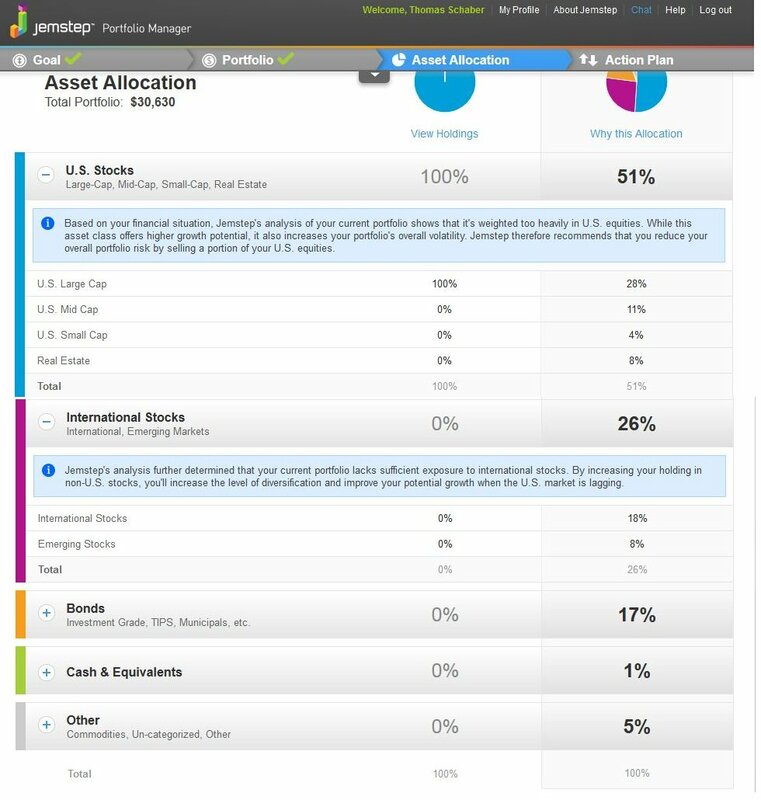 Jemstep’s investment recommendations are personalized for each investor. Anything that distracts you from following a plan is a danger to successful implementation of the plan. The simpler the plan, the more likely it is that it will be successfully executed. 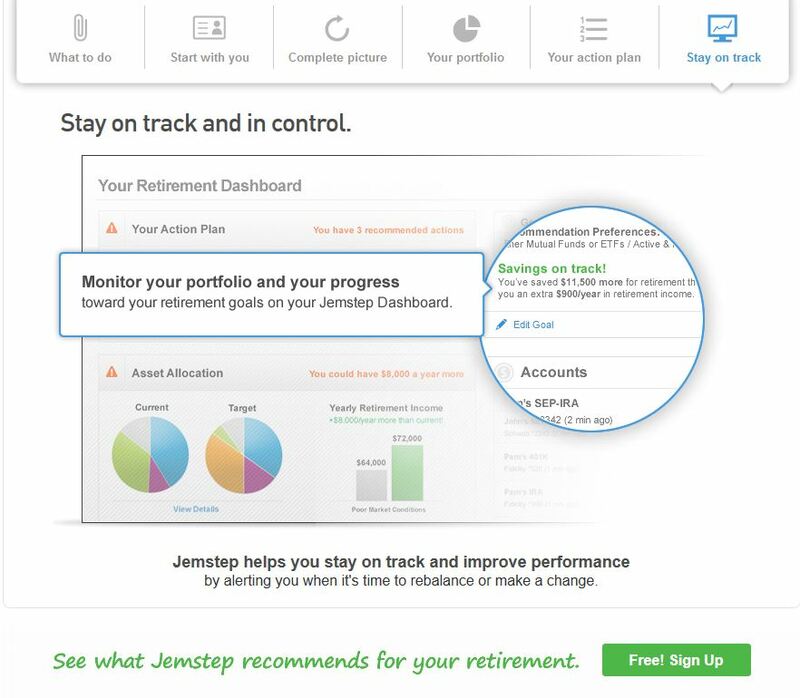 Jemstep offers to “keep you on track” with periodic recommendations to rebalance or make a change. Do you think there is ANY chance that over the next 47 years, you might fail to do exactly what they recommend? Do you think that they will even be around for the next 47 years?